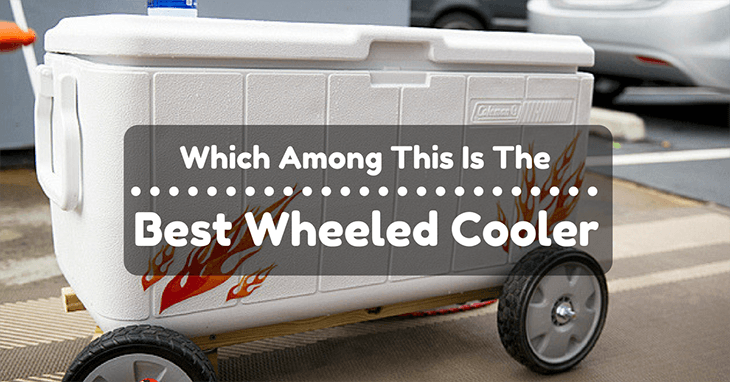 →Which Among This Is The Best Wheeled Cooler? You Will Be Torn With Number 2! Which Among This 5 Is The Best Wheeled Cooler? You Will Be Torn With Number 2! 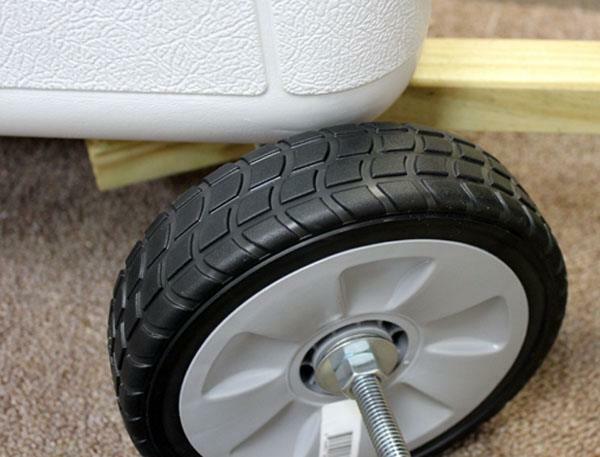 The first thing you should consider when buying a wheeled cooler is the size. Yep, the size matters. Will it fit your trunk? Will it fit in your car? Will it fit on the rack? How much space does it consume in the car? Should I leave one of my sons or daughter to accommodate the coolers space? Will my husband or wife be okay with leaving one of the children? Just kidding! Well, you get what I mean. The bigger your cooler gets, the more space it will consume in your trunk. You may want to check out what you bring during family outings. How much food, ice, meat, fish, or other stuff you need to put inside a cooler. Now that you know how much things you bring, you can determine the size you need. Most of the time, the adult in the household is tasked to push or pull this cooler around. The handle height is really important to match the tallest person! If you would have your baby push it around, you could at least set it at its lowest height. Of course, be careful with this technique, if your wife sees it, you’re in trouble! Some coolers have fixed handles. Some others have a telescopic adjustable handle. Obviously, the fixed handles offer more durability as it has less moving parts compared with telescopic handles. The problem with this is you can’t adjust the height. If you are in for some long haul, you might strain your back. However, telescopic handles can be easily adjusted to the right height. Since it has more moving and adjusting parts, they are more prone to breakage. 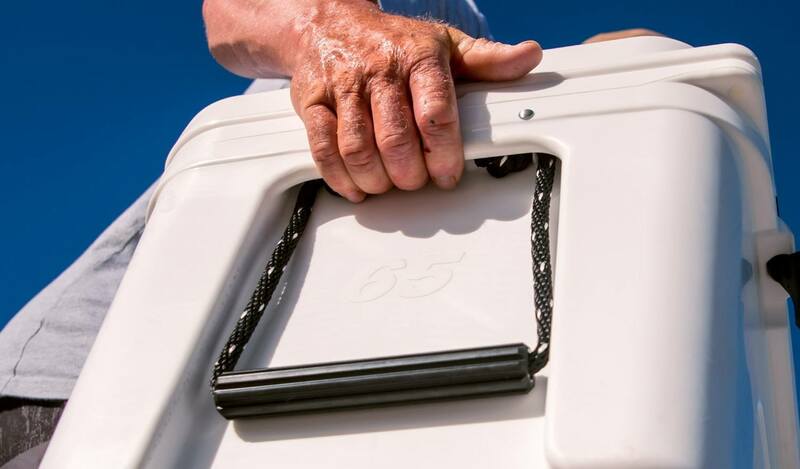 If you intend to hand down your cooler to the fifth generation of the family, go for a fixed handle instead! Tare weight may seem of little value since you have a wheel. But, it’s still important to have a lightweight and durable cooler. Imagine when you go fishing on the river and caught some 45 pounds of fish (that’s a lot! ), or sometimes, you want to put a big watermelo﻿﻿n inside the cooler, you know yourself that you can lift 45 pounds and walk a few miles with it on your back. But if you got a heavy tare weight, it would add up to the weight you would lift on the rocky patches of the journey! You might end up throwing back a few fish in the river so you could bring home the loot! Having a lightweight, portable, and durable wheeled cooler can make the difference. When you are going off road, the big wheels of your truck make the journey easier. The same goes with your cooler wheels! Thin and flimsy wheels will do but may not preserve the integrity of your cooler. On the other hand, heavy duty thick wheels can get through unforgiving patches of rocky terrain! But if you are not going to some perilous adventures where you need a wheeled cooler, like a picnic park, for example, ordinary wheels will do. But hey, big wheels can do that too! Having big sturdy wheels will work great on rocky terrains and pavements. So, you might as well go for the big wheels! When the picnic is over, and you are finally home, the messy clean up begins! If your cooler doesn’t have a drain plug, you might consider drilling a hole! But that would be impractical and would cost you more money in the end! So, when looking for a cooler, having a drain plug can make a huge difference. It can reduce the clean-up time in half as you won’t need to flip over your cooler to evacuate the soapy fluid you made! If your cooler has a can holder, it also serves as a great table for camping! A hole for a beer, soda, wine or whatever drink you have is nice to have! Why don’t all manufacturers do this? Igloo was established in 1947. The company is in existence for 70 years now! The company’s mere existence is a testimony that they are worth their craft. For decades, Igloo has manufactured different models of durable coolers. The Glide PRO has durable telescopic handles that can accommodate up to 110 quarts of space! That translates to a hundred and fifty cans of soda! It has a drain plug for easy cleaning and fishkeeper’s scale to measure your catch! Large volume - Store up to one hundred and fifty cans in one haul. This large compartment means you can tug more beer, or soda, or ice, or fish! Telescopic handles - Extending the handles gives you leverage when pulling your cooler. This allows you to exert little effort when your cooler is already filled and heavy. Flimsy latch - Igloo has done a pretty job in the insulation of the cooler, but they seem to have missed out the lid latches. They are flimsy and a little hard to lock. A little expensive - This is quite expensive among the selection you see here. But hey, you get a nice quality wheeled cooler you can push around easily even on grass and rocky patches. Coleman Company Inc. has been in existence since the 1900s! Can you believe that? Coleman is an 117-year-old company that has been passed along from generations to generations and upheld their quality since their establishment! The company manufactures various camping gears and a wide range of coolers. 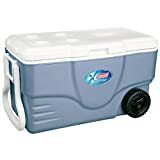 This model, Xtreme Cooler, is Coleman’s champion. They claim that this cooler can keep ice for five days! I can tell you that Coleman is true to their word! You can watch this fellow on youtube who experimented with how long Xtreme Cooler can keep ice! Affordable - With the quality of its construction, this product is worth its price. Just the right size - If you don’t have a huge family, you can fit in enough food for a five-person picnic and give away a few more servings! This size will not get in the way of your car and would not take too much space. Holds 85 cans - That is three and a half boxes of soda or beer in a can that you can fit in this box. Enough for a small gathering of some sort! Ice lasts for more than five days - A fellow on youtube challenged the claims of Coleman and found out that they even lasted for 11 days! That's why you don't need to worry to bring some ice cream, or shaved ice in summer picnic for your family especial for your kids. Fixed handles - What you go with this Coleman Xtreme cooler is a pivoting handle. You cannot extend it. If you fill it to the brim, it would require some effort from you to pull it. You cannot push it with this handle. Because the handle has a fixed length, you don’t get much leverage when lifting it on the side. No latch - The lid fits snugly in place. But if you are bringing this on extreme conditions, you may be a little worried about it accidentally getting opened and spilling everything inside! In our line-up is another model from Igloo. This model is a lot smaller than the one mentioned above. This has a 28-quart capacity and has telescopic adjustable handles. It has a blue base, a white lid, and durable wheels. It can hold up to 37 pieces of 12-ounce cans easily. This is a narrow cooler resembling a travel luggage. The handles are positioned at the wider section. It stands 19 inches high and can store liter bottles upright. Slim design - The slim design allows this cooler to take up little space in your trunk! It’s as if it’s not there! If you intend to use them to store beverages on a day tour, this will serve a great purpose! Durable telescopic handles - The handle extends up to three tiers. If you are quite tall, you won’t have trouble straining your back while pulling this cooler. Inexpensive - The price is something you can ignore. There are occasions where huge coolers are required, and there are events that you will only need a few bottles of chilled wine. This is your cooler for that! Small for all the other gigs - This will not be a great cooler for a party. It will be too small for that purpose. It’s not even advisable for a fishing trip. The ice would eat up space! Flimsy handles - Since this is a small chest, it is fitted with smaller handles. When filled to the brim, the handle feels like a little flimsy. What do you know? Coleman’s Xtreme Cooler is back and packed with more muscle! This is a Xtreme Cooler has a bigger capacity than the one mentioned above. It boasts a 100quart capacity and the same specs. It holds up to six and a half boxes of 12-ounce soda or beer cans! That is a total of 160 cans! Whopping 165 cans - If 85 cans are not enough for the party, why not have 165? This cooler can fit 165 cans with ease! Preserves ice for days - Let’s say a zombie apocalypse takes place. You can still enjoy 165 cold beers before your fate ends! But on a serious note, the Xtreme Cooler’s capability is exceptional. Bang for the buck - This item is not a rip-off. It does what it says it does and you get the value of your money. Handles all over again - With a larger capacity, and I assume you would be choosing this because you plan to load it up with tons of drinks or ice, it gets a little more difficult to move around. Again, no leverage with the handles. They could have used larger wheels - Fitted with the same size of wheels, you run the risk of breaking those wheels when you tow them around in full capacity! Rubbermaid is just twenty years younger than Coleman Company Inc. They are in existence for 97 years! That’s almost a century! Rubbermaid specializes in household items, food storage, and coolers. This deep blue wheeled cooler boasts a 60-quart capacity. The two-tier telescopic handles are positioned at the back you can tow it around like a travel luggage. They boast a stain and odor resistant finish as they specialize on their food containers! It’s narrowly built and can save you some space at the back of your car! Lid separated in half - To preserve the temperature of the cooler, they designed the lid to be separated at the middle. You would not have to open the whole lid if whenever you need something! Just open half of the lid and pick what you need. Inexpensive for a 60-quart capacity - For a chest this big that has wheels, you’re in for a treat! Rubbermaid made sure that you can easily afford their product! Slim design - The slim design can easily fit in the back of your SUV! No need to stow the rear seat! This is exceptionally awesome if your car is at full capacity and you need to bring some cold drinks! Towing is a little awkward - Because of the wide dimension and the position of the handle, tugging and towing it when filled can feel a little awkward. You can’t race your friends to the door when you are tasked to pull this cooler! Hard to open - A small tab on the edge of the lid would have made opening it easier. The lid and the body are seamless, and you may need to pry it with a tool to open them. There you have it, folks! The five best wheeled cooler you can get your hands on. 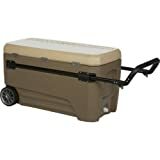 If you will camp, fish, or have a picnic with the family, there’s a right wheeled cooler for you! In this review, we can see that 62 quart Coleman has taken the upper hand in the selection! If only Coleman had fitted this model with a better handle, then you won’t have to think twice! Regarding design, Glide PRO Cooler have fused physics in their Glide PRO Cooler! If you are frequently out with your cooler, this will save your back! I hope I was able to help you choose your cooler! Feel free to leave a comment below, and I will get back to you soon!